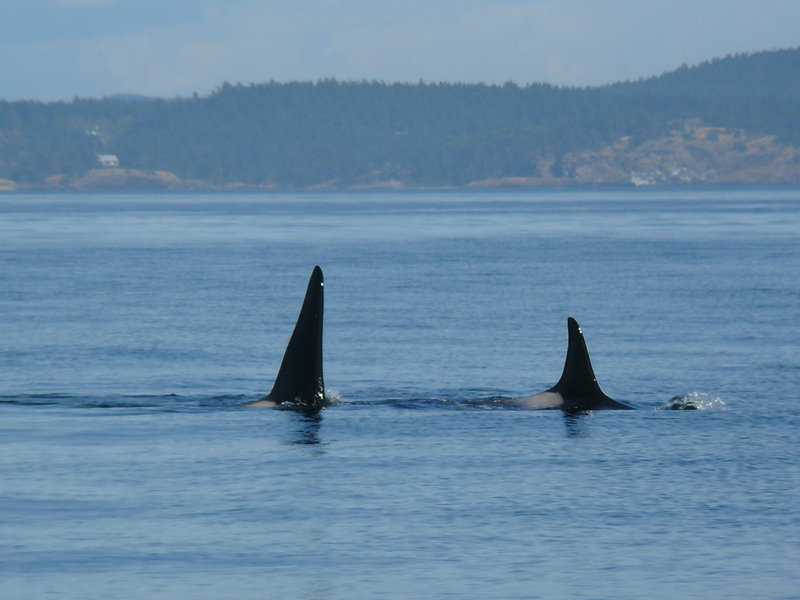 The Southern Resident Killer Whales are foraging, hopefully finding lots of Chinook Salmon, daily off the south end of San Juan Island! They are spending hours, spread apart in small groups milling about back and forth, doing the “west side shuffle” or dance I say, in the strong flooding tides, between Salmon Bank, Eagle Point, False Bay, and Hannah Heights. This is a historical feeding area, a future whale sanctuary? Spotted from Hannah Heights on Thursday and Friday, July 28 and July 29, 2011, from about 3:20pm to 4:05 pm. 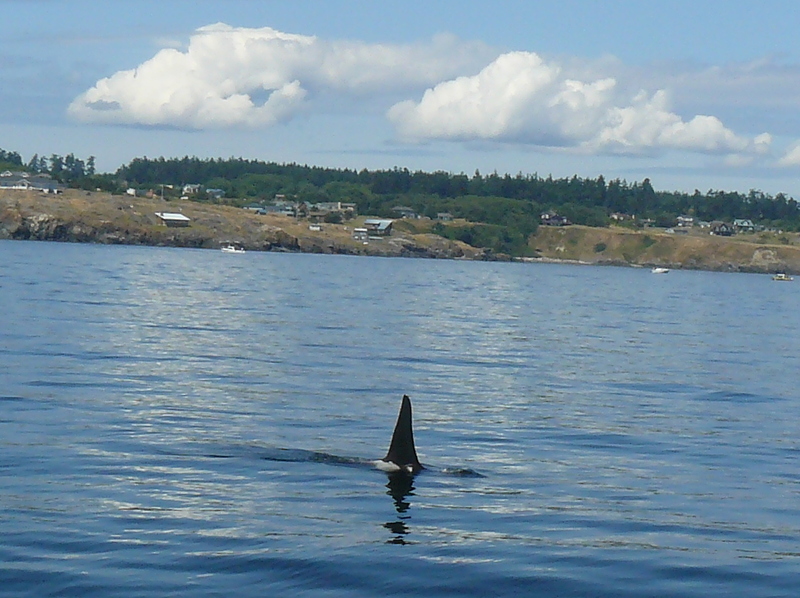 Sunny and Friday’s land tour supported by the Whale Museum, under a NOAA grant! New moon Wednesday July 27, 2011, showed that almost 9’ flooding tide used by J-27 Blackberry (a 20 year old orphan male), with his 16 year old sister J-31 Tsuchi, and little 8 year old brother J-39 Mako, foraging off of South Beach from about 2:50pm to 4:00pm. 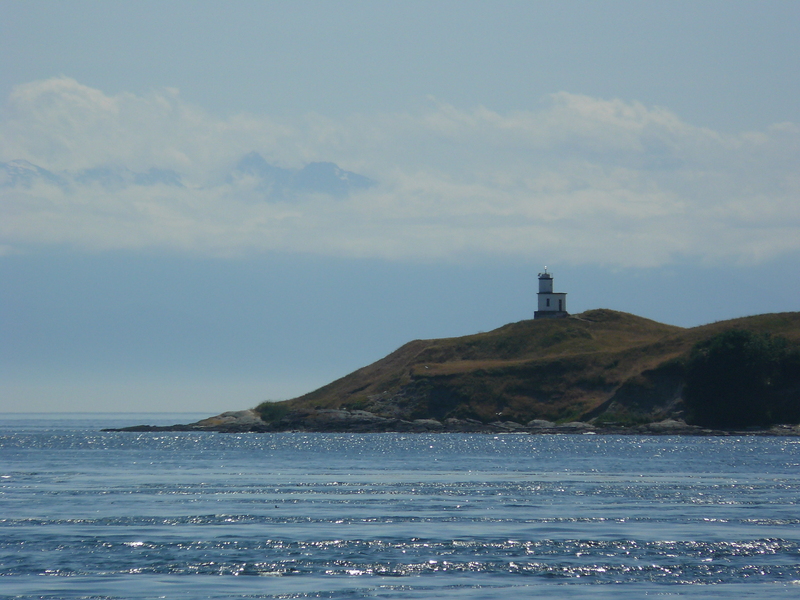 They were traveling southeast at first, as though scanning the area, then turned back southwest, further out in the Strait of Juan de Fuca. We could see other groups of Orcas spread out toward False Bay, delighted to see big boy 16 year old J-30 Riptide swimming southeast, with 26 year old K-16 Opus and her 9 year old son K-35 Sonata. They also changed directions and headed back southwest. They were swimming tight together, touching each other, when we saw J-30 Riptide roll and his ‘pink floyd’ flashed above the surface! Recent paternity results indicate the females choose the fathers and usually the older more mature males… We’ll have to see if K-16 Opus has a calf in about 15 to 18 months, or maybe they were playing, practicing, J-30 Riptide feeling frisky! We also saw a juvenile Minke Whale by Salmon Bank on our way back to Friday Harbor! Storm front coming in from the southeast on Monday, July 25, 2011, reminded me of October weather! We headed to False Bay and saw Orca dorsal fins at about 3:20pm, but it was getting bumpy out there in the Strait of Juan de Fuca, with the wind opposing the last of a strong flood tide, so couldn’t ID the whales and headed back to the calmer San Juan Channel. It was great the whales were still out here fishing! J-30 Riptide and K-16 Opus and K-35 Sonata just starrting to surface! Love their names and the fact that you can track them and see them play!!! Absolutely beautiful, I love them all. And everytime I eat salmon my mind wonders if the Puget Sound Orca’s are sharing the same meal at that moment with me?